The Shortboard certainly lives up to its name. 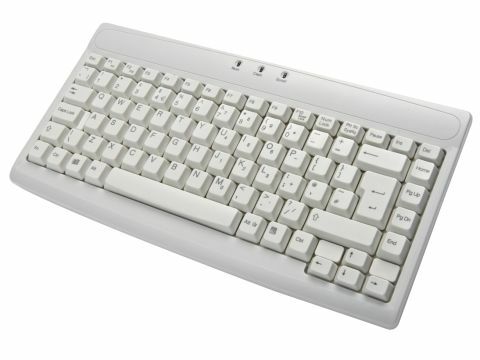 By removing the numeric keypad from the side, the keyboard has been made at least four inches shorter than standard models - but this doesn't mean a loss in functionality. On a regular keyboard, special characters that are inserted via Ascii codes can only be entered via the numbers on the keypad. Here, after pressing numlock, certain keys on the right hand side of the board are assigned keypad functions. This is a pain, but the keypad isn't used for much else, so isn't a massive problem. If you can live with this most minor of inconveniences, the Shortboard is a joy to use. The keys aren't as light as those on a laptop, nor as heavy as those on a standard QWERTY keyboard. Typing feels natural, and after testing some text entry, mistakes were few and far between. The Shortboard is essential if desktop space is scarce, even more so since it contains a USB port which could accomodate your mouse or a flash drive. But otherwise it's a good choice for light and accurate typing.